Piltdownlad - ZineWiki - the history and culture of zines, independent media and the small press. Piltdownlad is a typewritten, "personal narrative" zine published by Kelly Dessaint. Piltdownlad began in 2010. Each issue has a subtitle based on a featured autobiographical story. Some issues include only one story, others are collections of interconnected stories and a few include multiple articles along with stories, letter columns and zine reviews. No. 1: The Güero Chingón Stories - Five short tales about growing up a whiteboy in East LA. No. 2: Women Got Me Drinking - Adventures in the tourist trade, looking for love and drunken raging in the French Quarter. No. 3: Junior Careers - Adventures of a teenage door-to-door salesman, trying to make a buck selling candy in the San Gabriel Valley. No. 4: The Nasty Oh-Dear - The story of two brother from LA who move to Alabama and end up in foster care, plus a report from the 2012 LA Zine Fest, the impact of Dischord Records, notes on the papernet and zine reviews. No. 5: The Detour Guide - More adventures in the tourist trade, doing business with the down and out in downtown LA's Skid Row, a cross-country travelogue, with letters, notes on the papernet and zine reviews. No. 6: Institutionalized - Picks up where The Nasty Oh-Dear left off... from the foster home to the adolescent ward of Hillcrest Hospital, includes court documents, newspaper articles and other miscellany, plus letters and zine reviews. No. 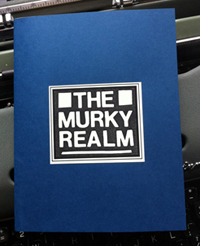 7: The Murky Realm - A biographical sketch of an improbable union. No. 8: The Olympic Spirit and Other Stories - More tales of growing up in the Latino streets of the San Gabriel Valley. This page was last modified on 17 September 2013, at 22:58.